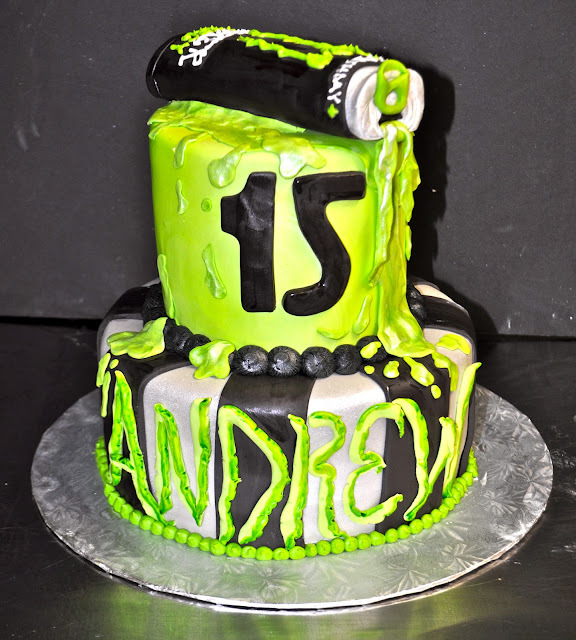 This fun cake was for Andrew's 15th Birthday with the theme of "Monster Energy Drinks". 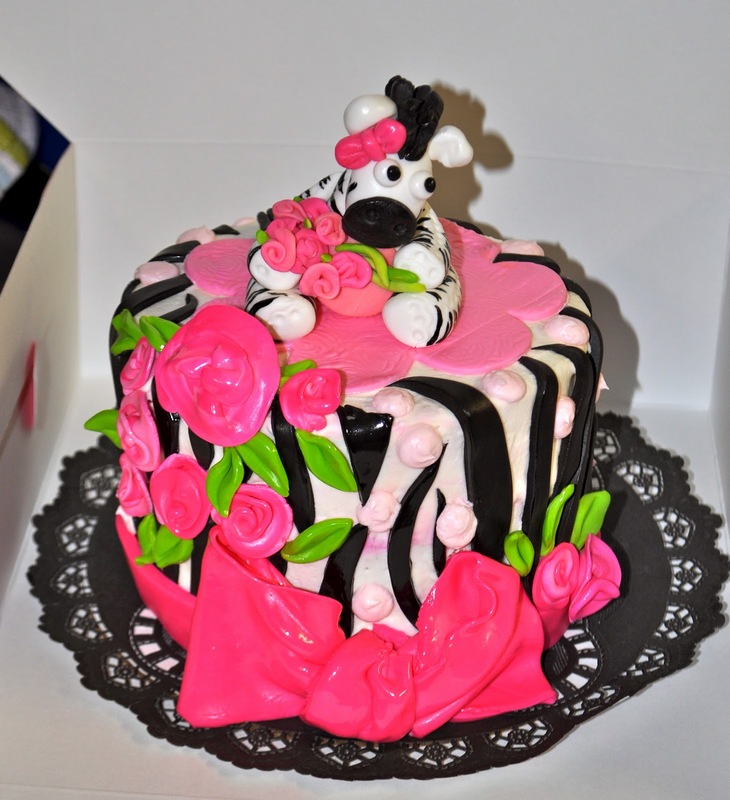 The cake is a 9" Chocolate cake, covered in fondant & airbrushed with a silver sheen, and black stripes. The top tier is a 6" white cake covered in green fondant airbrushed with neon green! 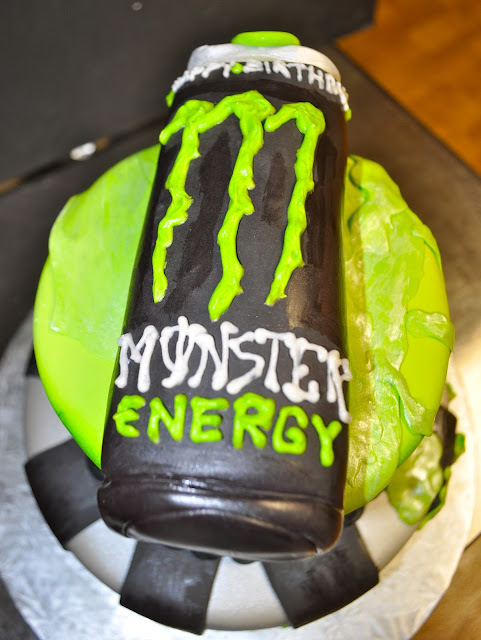 The can on top is made from fondant, and the drink "spilling out" is also fondant! 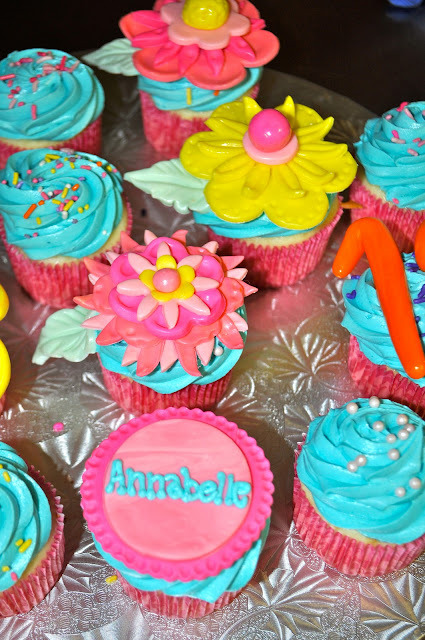 Here is one dozen cupcakes for Annabelle's 13th birthday. They were loosely based off of the cake "Elizabeths 21st Birthday" The cupcakes are white with Tiffany blue buttercream, and funky flowers and 13's made from fondant. These Christmas Cupcakes were made for my awesome hair dresser, Chris! They were a variety of flavors: white, double chocolate, red velvet, and confetti- with buttercream frosting and fun fondant details! They were packaged up in groups of four and looked so cute together!! 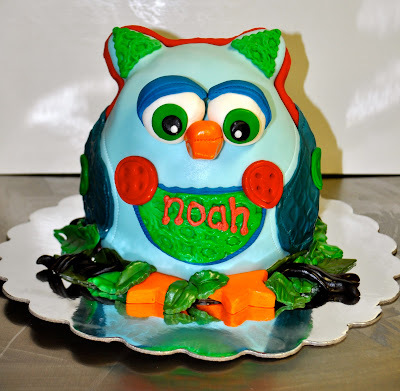 This cute owl cake and matching cupcakes were for Noah's first birthday! His mommy sent me a picture of a "girly" owl cake, so I went off of that general design, but made it more boy-ish and rustic. 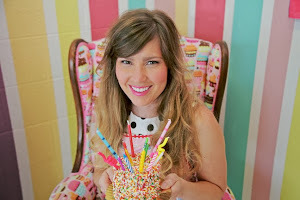 The cupcakes were red velvet, marble, and confetti- with sprinkles and buttercream to match. The actual smash cake was a white cake made out of 6" cakes, and covered in matching fondant made to look "stitched together". More Zebra print and pink??? You don't hear me complaining! :) I love it!! 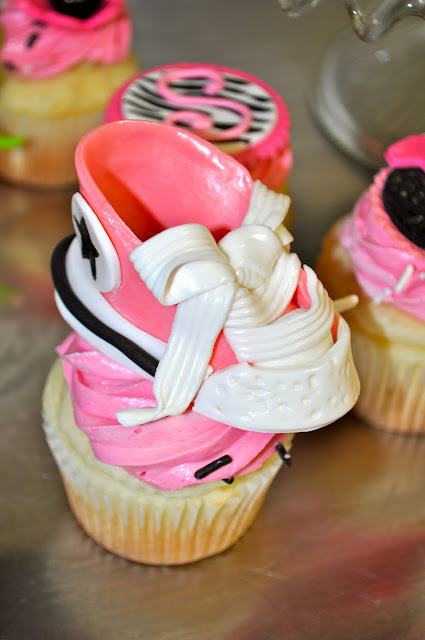 The theme for this smash combo was "converse shoes", and the Mommy also wanted it to to be uber-girly and pink! The Smash cake is a "Cupcake Cake" made from 6" and 4" white cake, covered in fondant with a fondant bow that has hand painted zebra stripes. The cupcakes were originally only going to have 2-d converse shoes, but I thought it would be too cute to make them 3-d, and I think they turned out awesome!! 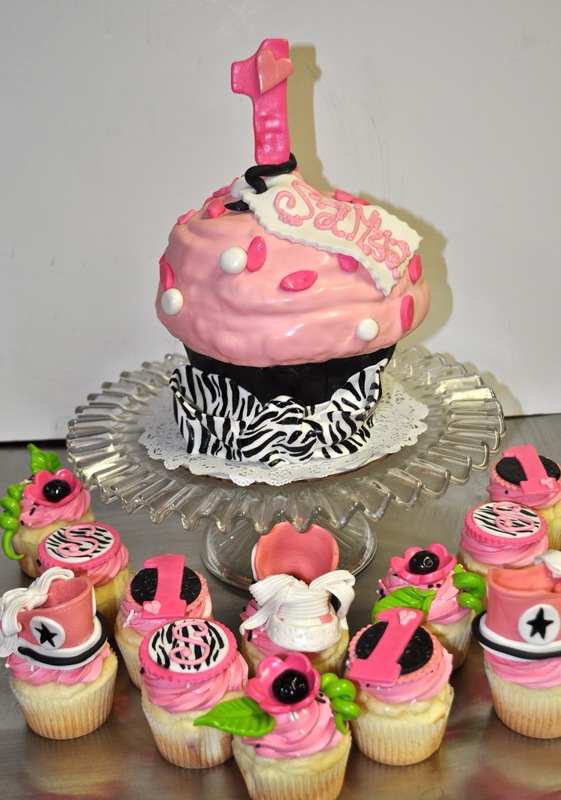 The cupcakes were one dozen white with pink buttercream and fun matching fondant toppers. 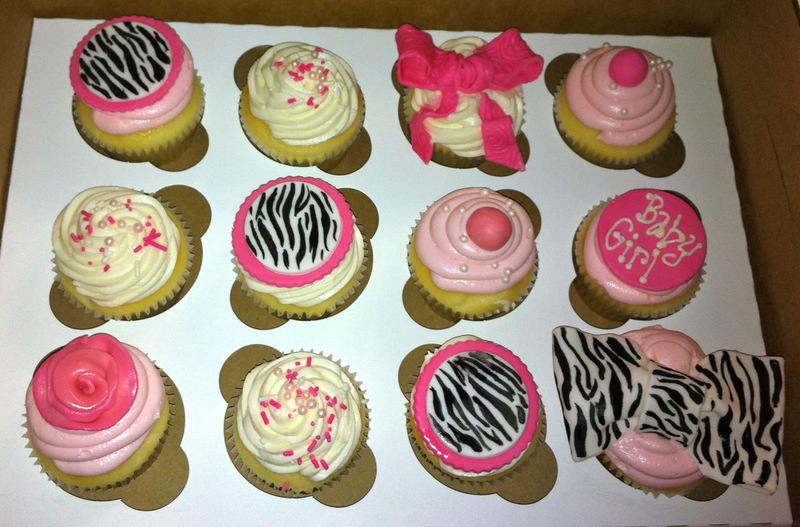 This order was for 3 dozen cupcakes (only 2 dozen pictured here) for a baby shower. The client said her sis in law loved pink and black, zebra, and bright colors and that I could basically do anything I wanted! I love pink and green combo's so I thought this theme would be super cute! The cupcakes were chocolate covered cherry and strawberry, with buttercream frosting and lots of fun fondant details: zebra toppers, roses, polka dots, & buttons etc. I got such a sweet request for some 21st Birthday Pink Champagne Cupcakes since the client's daughter was not a big drinker, and they still wanted to celebrate with champagne! How cute is that!?! These are one dozen pink champagne with pink champagne buttercream and pink fondant bows on top. It is hard to see in this picture but there is also edible glitter on the frosting by request of the client! 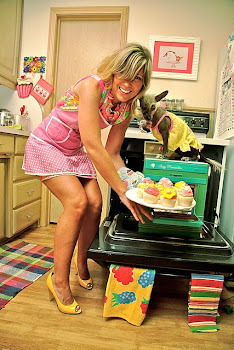 How fun and girly, I love it! Here we have a "Royal" themed baby shower cake for a baby boy. The top tier was a 6" strawberry cake covered in blue fondant and polka dots, the bottom 8" tier was a white cake with buttercream filling and covered in ivory fondant and blue and yellow stripes. The crown was made from fondant, airbrushed gold and all of the little balls around the borders are made from fondant as well. And who can forget the little booties! They are made from fondant, and were a last minute addition so I'm pretty happy with the way they turned out! This order was for the Parker McDonald Law Firm's "Party in the PM" party at Artspace 111! It was 6 dozen mini cupcakes, white and chocolate with buttercream and chocolate buttercream. 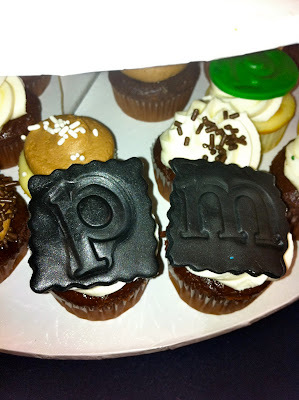 There were little "P" and "M"'s stamped into fondant, and also little "night scape" cutouts made from fondant. 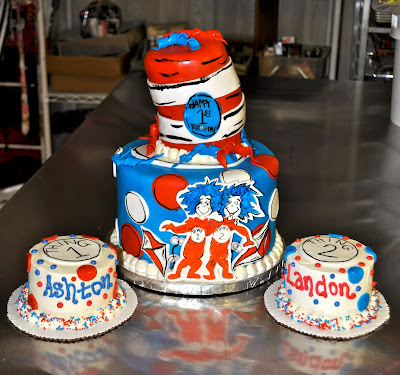 This fun cake is for Landon and Ashton's first birthday! 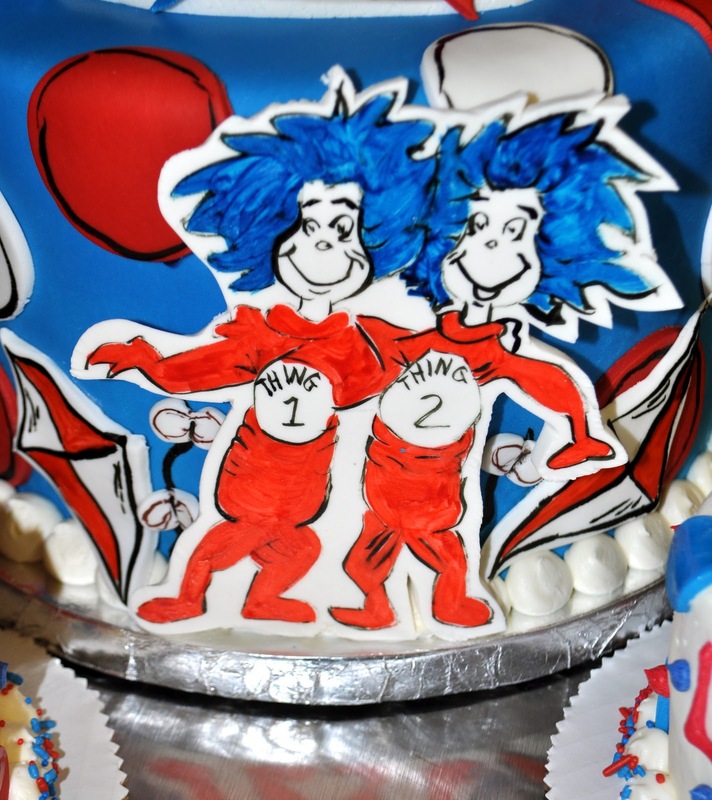 The theme of their party is "thing 1 and thing 2" from The Cat in the Hat! 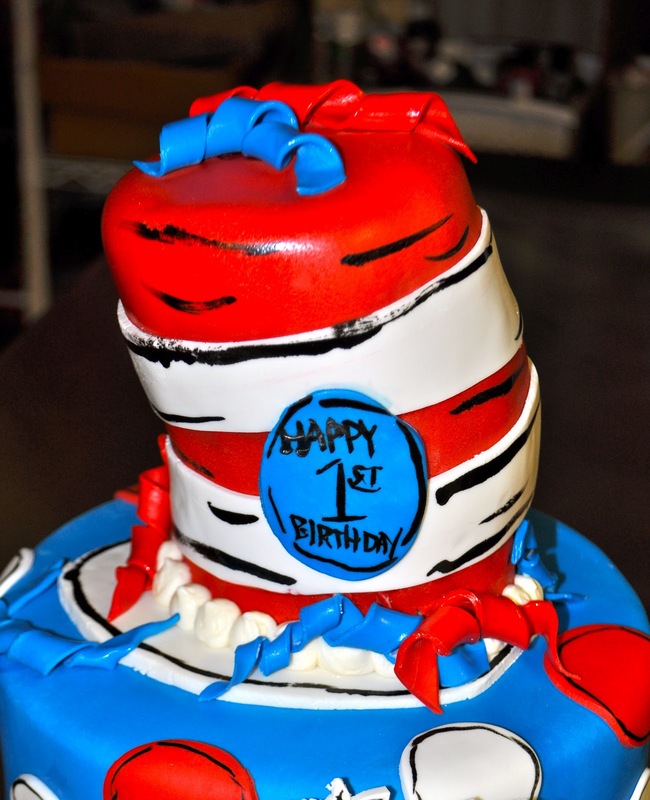 The big cake is an 8" chocolate cake with buttercream filling covered in blue fondant, and the "hat" is made from 4" confetti cake (with red and blue sprinkles) and covered in red and white fondant! The two little smash cakes are also 4" confetti cakes. 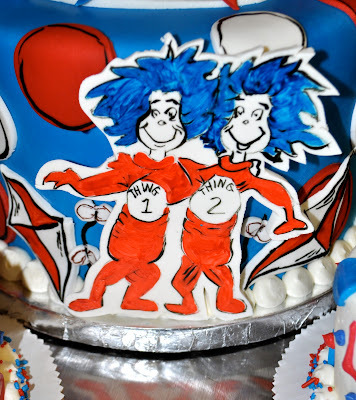 The Thing 1 and Thing 2 on the big cake are painted onto gumpaste with food coloring. This totally pink cake and smash cake combo is for Seeleigh's first birthday! Her mama designed the entire cake and I think it turned out super cute! The big cake is a 4" 6" 8" - the top and bottom tiers are white with buttercream filling and fresh raspberry filling and the middle tier is confetti with pink sprinkles! 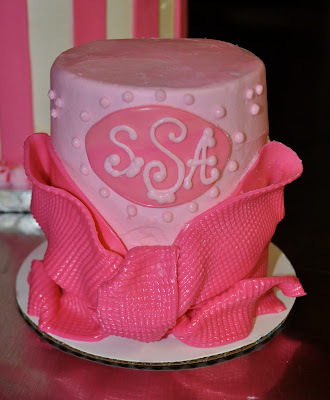 The smash cake is a tiny 4" white with pink buttercream frosting and a big pink fondant bow! 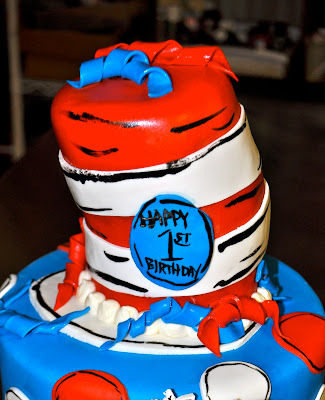 Isn't this cake so fun??! 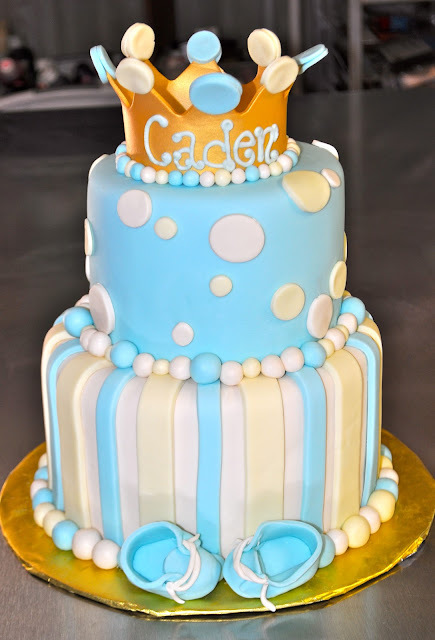 It is a 6" chocolate cake with buttercream filling, covered in a sky blue fondant for a special birthday. The client's dear friend loves birds, so she requested a "bird" cake. I thought it would be super cool to make a chocolate nest! 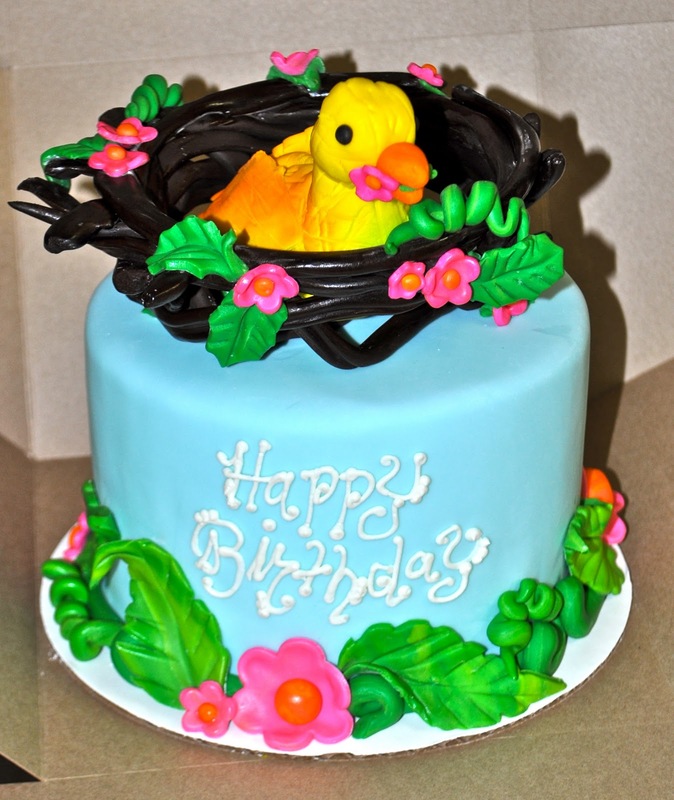 The birdie is made out of fondant, as are the leaves and flowers. It just makes me happy to look at! 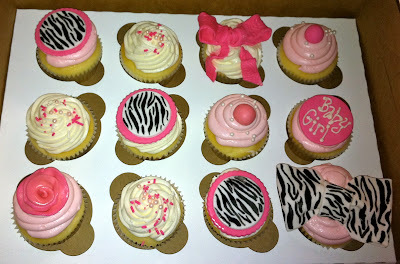 This cake & cupcake combo was for a zebra print themed baby girl baby shower! The client gave me free reign to do any design, as long as it was zebra'd out! 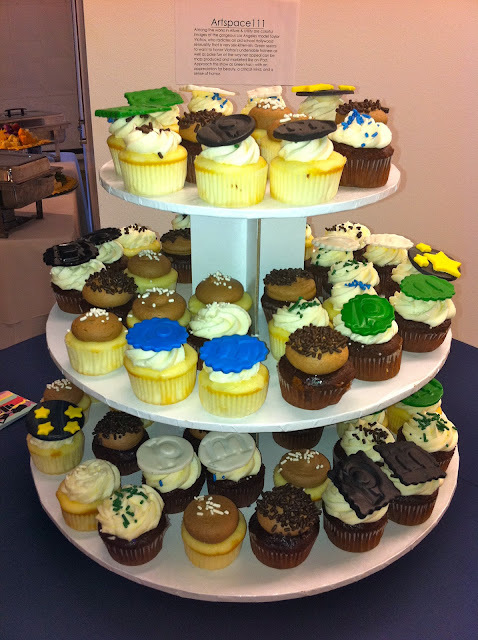 The cupcakes were 2 dozen mini and 2 dozen standard sized "half and half" white and chocolate. 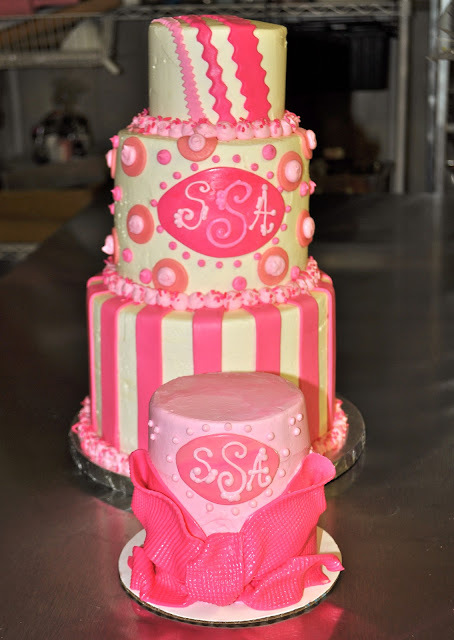 They were decorated with pink buttercream, hand painted zebra fondant toppers, matching fondant roses/pink details, and of course matching sprinkles! The cake was a 6" confetti (pink sprinkles) with pink buttercream filling and buttercream frosting. 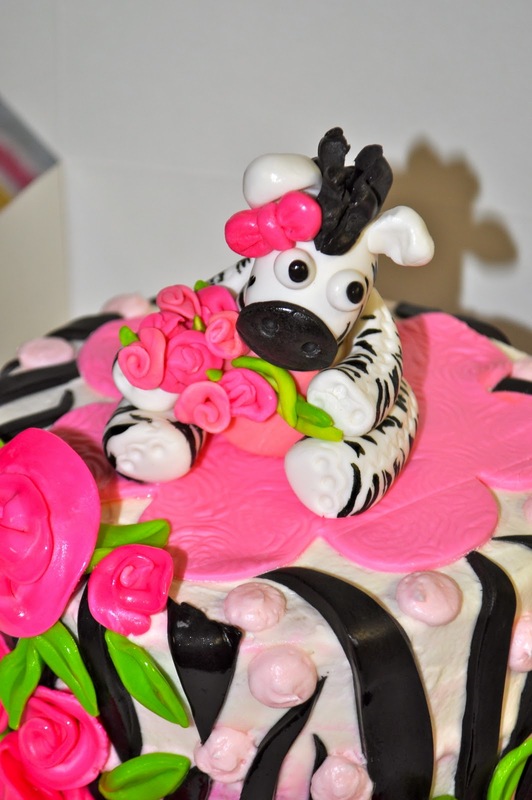 The cake was covered in fondant zebra stripes, pink roses, pink bow, and a cute little fondant zebra topper! 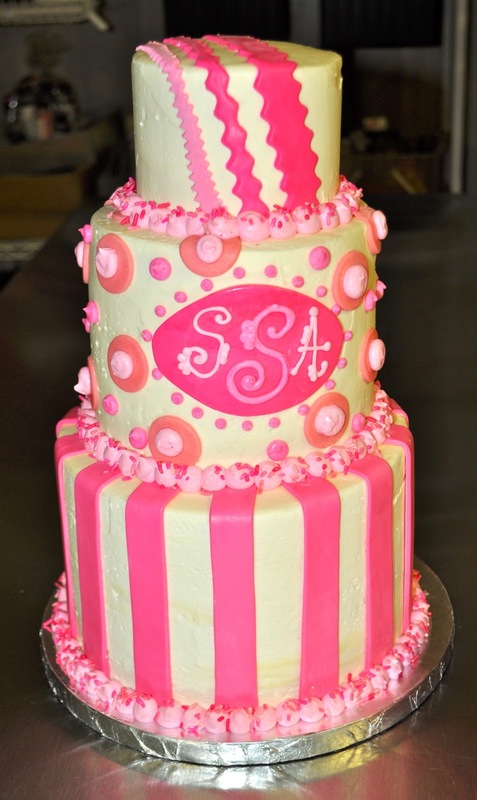 This cute little cake was for a 5th Birthday Princess Party! 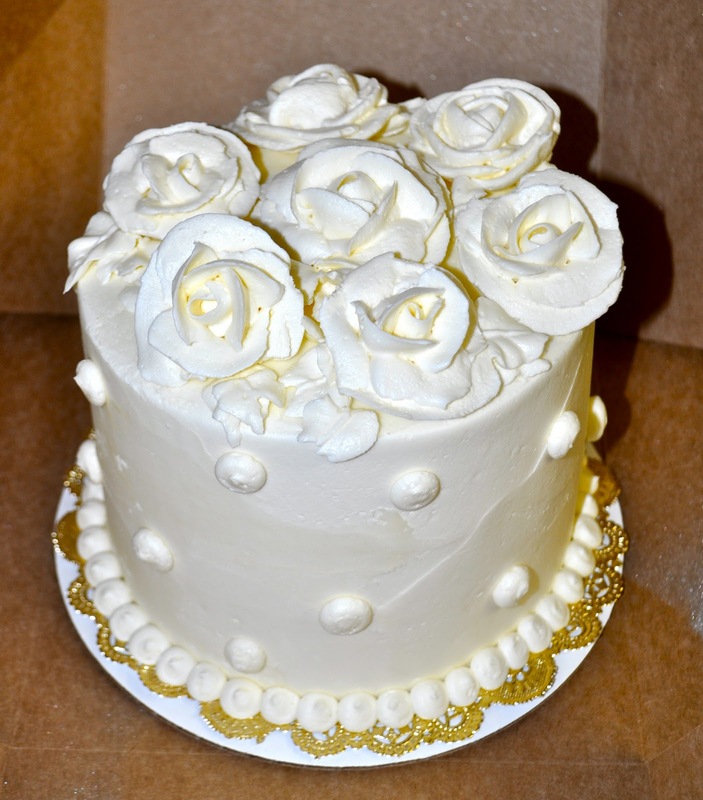 The cake was a 6" white cake with buttercream filling and frosting. The crown on top was made from textured fondant. Simple, yet cute as can be! This cake was designed by Brad's sweet girlfriend Casey for his 30th Birthday. 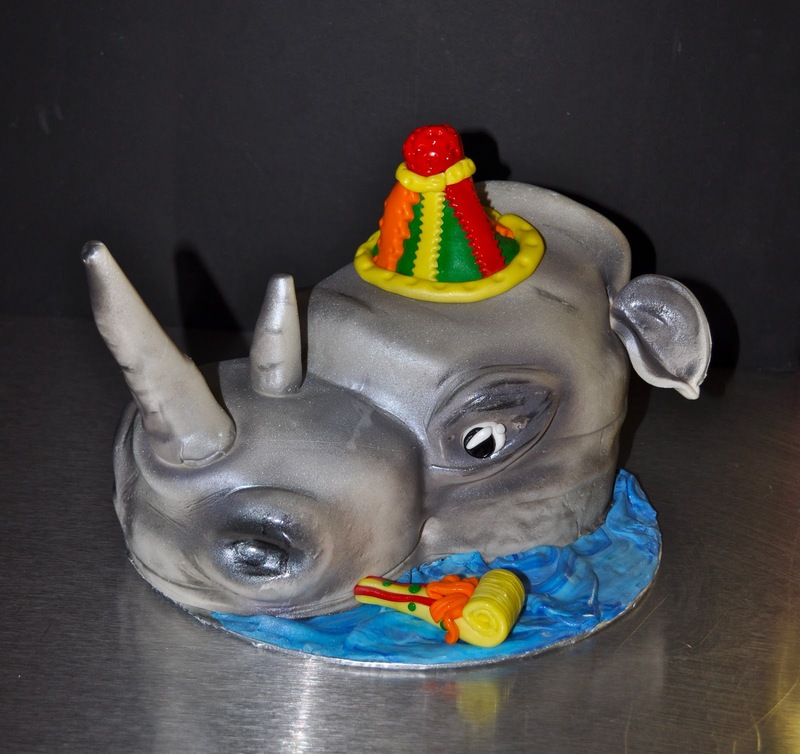 It is an 8" double chocolate cake covered in buttercream frosting with lots of fondant details! The top is covered in piano keys, with fondant notes, treble clef, "30", and on the back not pictured is the state of Tennessee with a Nashville star on back! 3 dozen mini cupcakes for a TVS football tailgate! They were white and chocolate with butercream frosting and fun TVS football themed details. Go Trojans!! These cupcakes were a donation for of my favorite customer's "Breast Cancer Awareness Booth" for the 2nd year at the South Euless Elementary PTA's fall carnival October 22, 2011. All profits were be donated to Susan G Komen on behalf of South Euless Elementary. 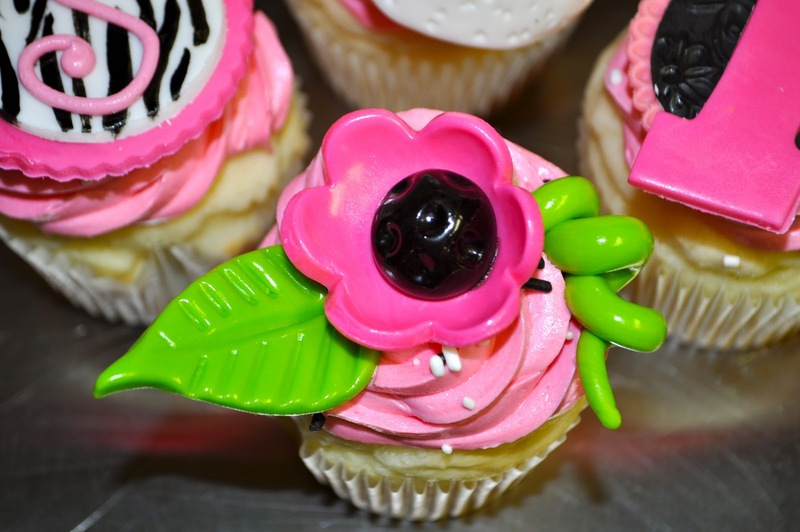 Here theme was "Cupcakes for a Cure" How cute is that??!? Breast Cancer Awareness is very near and dear to my heart so I was honored to be a part of it! These cupcakes were made for a 90th birthday celebration and decorated based off of the colors/design of the invitation! They were 4 dozen standard and 4 dozen mini, with a combination of white, chocolate, confetti and red velvet cupcakes! I had a request from one my very faithful clients (love my repeat customers, you are the best!) for some Pokemon cupcakes! Much like the angry bird cupcakes, I have very little knowledge of anything Pokemon related- so I hope I did them some justice! :) They cupcakes were 2 dozen mini and one dozen standard white, chocolate, and strawberry all with buttercream frosting. The pokemon characters and "5"s are all made from fondant. Hi everyone! I wanted to give an update on the progress of the storefront since there has actually been *GASP* progress!! 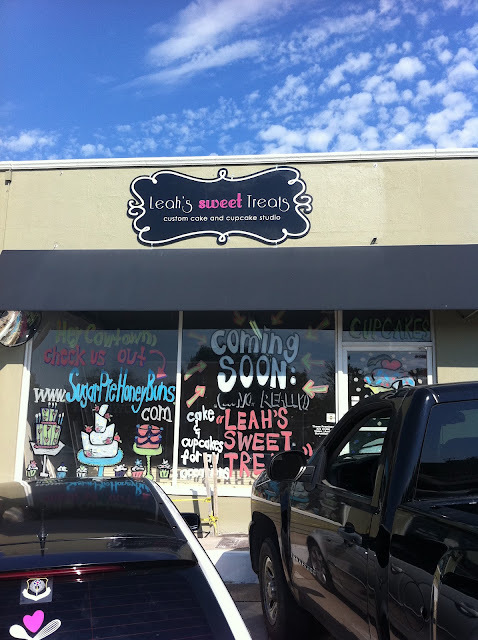 :) I am so excited and literally CANNOT wait to get open! As for the actual construction, we have walls up, plumbing installed, electric done, and are getting close to working on the more exciting stuff- aka paint and decor :) I was realllly, really hoping to be open by the end of October but it is looking more like Mid- November. Once we get an actual date of completion I will be promoting our grand opening which will fall on a Saturday! Stay tuned for that announcement because it's going to be an awesome event!! I also wanted to explain to everyone my vision and what you can expect when you come in once we are open! 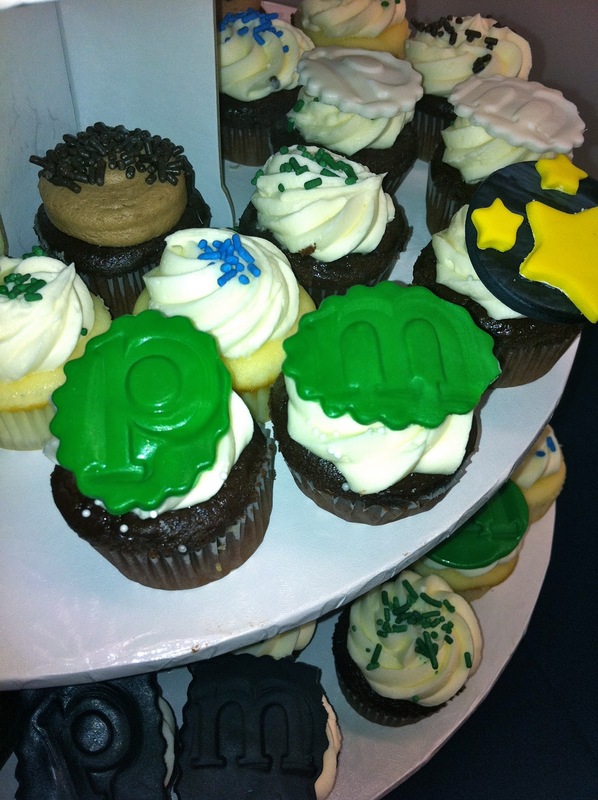 There will be retail cupcakes for sale every day. There will be one case where you can walk in and purchase one cupcake to eat on the spot, or as many as you would like! 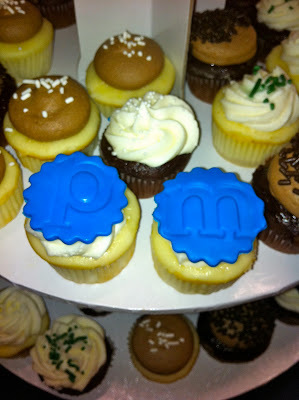 But there will also be the refrigerated case where there will be a variety of "Grab and Go" pre-boxed cupcakes. I am so excited for this! 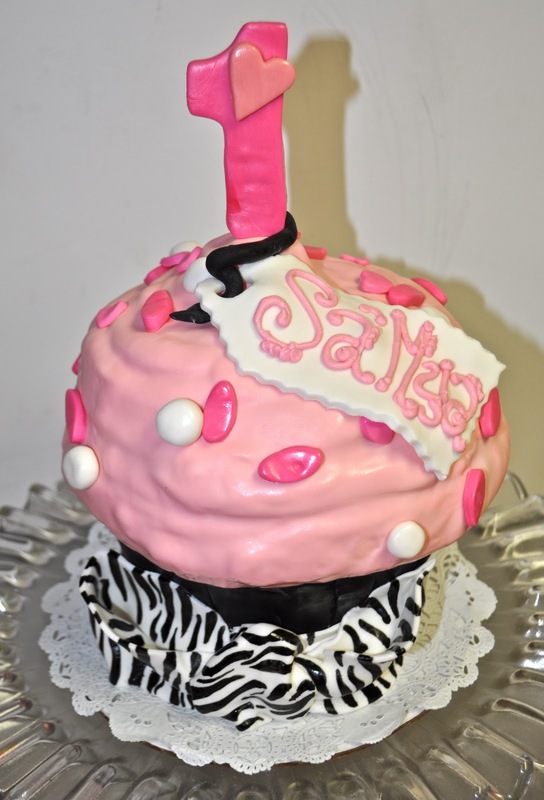 They will be a variety of flavors, and also decorated with custom fondant decor! So for instance when the holidays come up if you are in a crunch you can stop in on the fly and pick up one dozen or two dozen amazingly cute, ready to go, already decorated cupcakes! I think it's going to be a hit and like nothing else you can find in Fort Worth!! 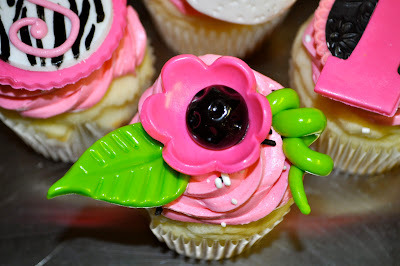 If you like what I do with my custom cupcake orders, you will definitely like this! These "Grab and Go's" will be available every day (first come, first serve) and the themes will change according to seasons/holidays/events etc! The closer we get to opening the closer we are getting to having an actual LAND LINE phone (woohoo!!!!!) And we can all communicate via phone, or better yet in person! So please stay tuned for the new number! I also wanted to encourage everyone to place their orders for Halloween ASAP (how the heck is it already mid October?!?!) I have sooo many cute ideas for Halloween cupcakes-- shoot me an email Leah@SugarPieHoneyBuns.com if you would like to place an order!! Oh, and one last thing!! I have been working with my amazing graphic designer/photographer team on an entirely new website for literally months now! 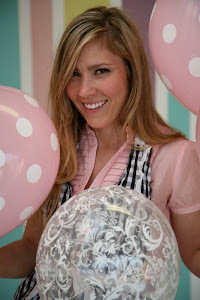 (Same domain- www.sugarpiehoneybuns.com) But it is literally soooo CAAAA-YUUUUUTE and unique and ME- I cannot wait to reveal it to you guys!! It really conveys what Leah's Sweet Treats is to me and my actual aesthetic so it's going to be awesome! 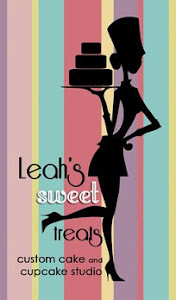 We have been waiting until we get the new contact info so please be sure to check my facebook www.facebook.com/Leahs.Sweet.Treats for updates and the announcement of new website!! Just wanted you to know the beautifully crafted rhinocerous cake was just as delicious as it was impressive. All the business cards disappeared. I'm carving up the leftovers to share with neighbors. Thank you for making Robert's 5th birthday special. -J"